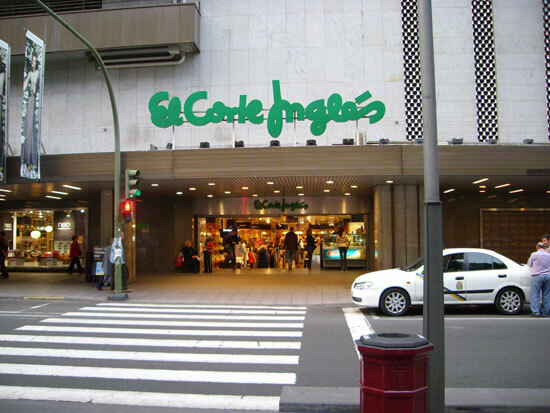 El Corte Ingles is THE department store of Gran Canaria. They are now offering a special 10% discount for all (over 18 year old) tourists from outside Spain, so remember to take your passport (or other ID with a photo) in order to take full advantage of this.This discount is not applicable to food, books, and other items. Click here to learn how to take maximum advantage of this card. The department store is divided into two buildings: one has all the items for home, i.e. furniture, cutlery, crockery, bedsheets, electronics, and computers; the other has all the fashion items and food, i.e. clothing for all ages, sports items, a restaurant, and a supermarket. Both buildings are located in Avenida Mesa y Lopez, a commercial street full of other shops like Zara, Marks & Spencer, Mango, Clarks shoes, Banana Computer (Apple Shop) etc. Basement - Pet accessories, DIY and hardware, cobbler. Ground floor - Bookshop, newspaper shop, restaurants (includes Starbucks). 1st Floor - Computers, phones, TVs, etc. 2nd Floor - Toys, Stationery, gifts, souvenirs, customer service. Mesa y Lopez 18 - In this building you will find all kinds of clothes and fashion items. Ground floor - Fashion accessories, branded sunglasses, watches, perfumes, cosmetics, jewellery, optician. This is always the busiest floor. Third floor - Children's clothing,toys, and a shoe shop for everyone. Fifth floor - Sports clothes and equipment. Sixth floor - Bargains, hair dresser, dry cleaner, post office, travel agency watch repairs. Best prices during the sale period (July-August & January 7th-February). Nice pastry shop by the supermarket. We strongly recommend to check all electronic items properly before leaving the store. One must make sure they are new and working properly. Good idea to visit other high quality shops available nearby. Taxis are readily available near both buildings. Parking is available in both buildings, and also in the Plaza España underground parking. There is building work going on in front of this shop, so all the cars have been re-routed around the back of both buildings. There is a shopping card service, in Spanish "Carta de compras." As you shop around, all purchases are written down and stored, so that you can pick them all up together, when you have finished shopping, instead of carrying all the bags around. Other services they offer are: translation service, shopping delivered to your hotel, and currency exchange. You can get more information about these in the special Tourist Information Center on the ground floor. Here, you can also collect the Canarian Tax (IGIC) refund forms, if you are from a country outside the European Union, although it isn't really worth the hassle. Many items have a 3% tax, others 6.5%, and only the luxury items have a higher rate. By bus: Take the Global bus number 30 from Maspalomas/Playa del Ingles/San Agustin or bus number 91 from Puerto Rico and get down at the main bus station (San Telmo). Then take yellow bus number 17 from the top of the bus station. Taxis are also available and cost 5 euros. By taxi: Get into the taxi and shout "Corte Ingles"
By car: Get onto the motorway GC-1 and keep on the center lane all the time. When the center lane becomes a right lane of a tunnel, it is time to get out on the right of the tunnel, and then turn left on the roundabout after the traffic light. If you’re serious about shopping in El Corte Ingles, you can take advantage of their free bus. This bus stops near various four and five-star hotels in Maspalomas, Playa del Ingles, and San Agustin. Then, it heads straight to the department store, in Las Palmas de Gran Canaria. Currently it is running on Mondays, Tuesdays, and Thursdays. You can visit the department store, and do some shopping. Then you can walk around town, and be ready to be picked up in the evening. This free shuttle is only valid for non-resident foreign visitors who are willing to make a purchase. Each person must buy something and show proof of payment, at the tourist information desk, before going back. Our recommendation: definitely worth it, if you are serious about buying things. If you just want to browse, and haven’t made up your mind, the public bus is a better option. It costs just a few euros, and you have no obligation to buy anything at all. To find out more, and confirm the pick-up points, timings, and days, give them a ring at +34 928 263 000. Click here to go to their website (opens in a new window). Sundays open during the Christmas season, or the cruise ship season (October to end April).